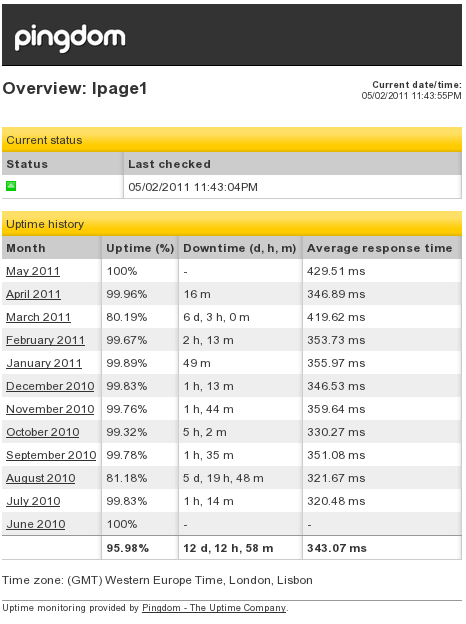 On this page you will find the monitoring results and other details regarding a Ipage Linux shared hosting account that I maintain with them. Ipage is one of the many brands that are under the Endurance International Group umbrella, such as: Startlogic , EasyCGI , PowWeb , Ipower, Ipowerweb, Dot5hosting, Fatcow etc. For explanations on how to interpret what you see on this page, read this guide (link opens in a new window so that you can refer to the document repeatedly if needed). Please use the following link to signup with Ipage . Tip for discount: if you try to leave during the order process you'll be offered 60% off the regular price. A detailed table with information on this server's hardware etc. was not available due to server side access limitations. To see a detailed table with information about PHP extensions, settings etc. on this server, please click on this link (opens in a new window).